I arrived at CBCA well before dawn. I knew from a visit a week earlier that a large amount of waterfowl, specifically Pintail, were using the habitat here and my hope was to catch some early morning photos of these birds flying by. In one of the large pools alongside the road I saw nearly 50 of these bizarre birds with a bill almost as long as their bodies. They were not very flighty at all, allowing me in my “mobile blind” to easily get within distance for some decent shots. 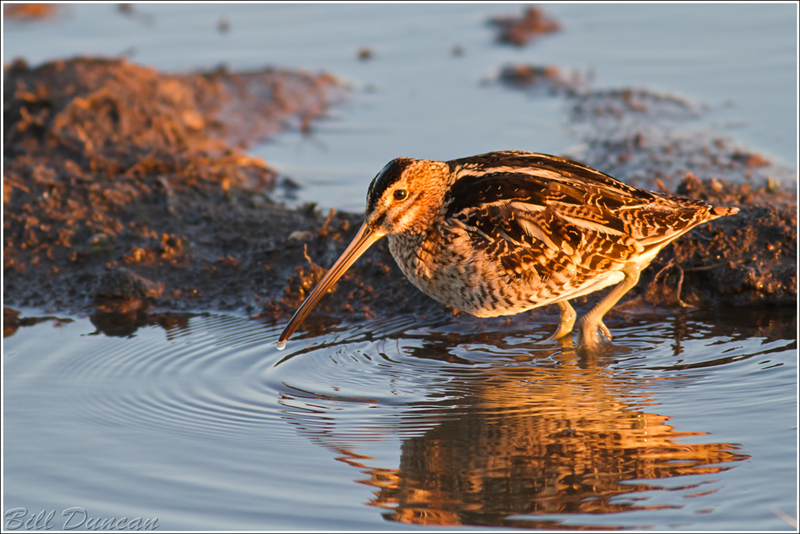 Members of the Scolopacidae family of shorebirds include the traditional Sandpipers, the beautiful Phalaropes, the Curlews, the Dowitchers, and several others – including the bird pictured above, the Common Snipe. The Scolopacids are well known for their complex and diverse mating behaviors. Not as complex or developed as the Passerine songbirds, this group also uses extensive advertisement vocalizations, most likely evolved to be well understood on their vast tundra breeding grounds. Similar to its cousin, the Woodcock, the Common Snipe uses a “winnowing display” to attract mates. These birds will fly high into the air and plummet towards the ground while fanning their tail feathers, which make a distinctive winnowing noise as the air rushed rapidly over them. Looking closely at the length of a shorebird species’ bill gives a great clue to what the bird feeds on and how much water they typically forage in. With the great diversity in the morphology of these birds, the specific depth of water and vegetation these species are accustomed to and food sources they utilize, it is no wonder that habitat management programs can be quite complex. What works great for waterfowl or a particular species of shorebird may not be useable at all for another species. CBCA has come a long way in providing the diversity of habitat and the managers seem to be doing a great job in their management practices, especially considering the unpredictable weather patterns we have had in this region the past several years. Next Next post: It’s Spring Again. Everybody Know it’s Spring Again.